The Shell Helix mini portable umbrella adds an innovative twist to a classic design. Incredibly convenient and small enough to store in a glove box, it ensures users always have protection on hand. 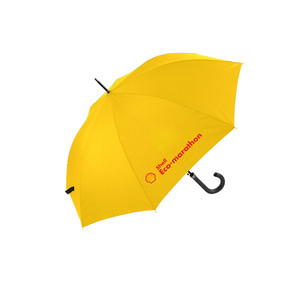 In high visibility yellow it is ideal for darker days while the slight curve protects from wind and rain. The spokes are flush to the fabric ensuring the ultimate health and safety when in use while the soft grip handle makes it a comfortable umbrella to use. Finished with a red flash of the Helix logo, this mini umbrella is practical, easy to store and stylish. This umbrella is unlike any other, as it combines the latest in technology with traditional protection from the elements. Although invisible to the naked eye, this Safebrella hides a powerful LED torch in the handle, allowing it to illuminate the path while walking or to be used on its own. The fibre glass ribs and metal shaft ensure a strong construction, while the reflective material provides safety by ensuring clear visibility at all times. In bright red and sporting the Pecten, there’s nothing ordinary about this extraordinary umbrella.